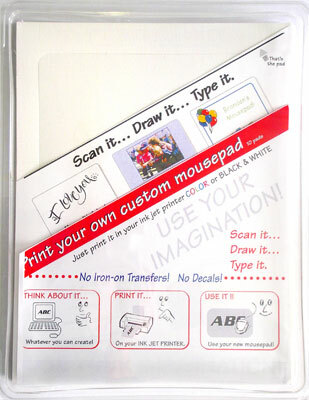 Customised Mousepad - Create and print your own mousepad. Print Your Own Mousepad on your Ink Jet Printer in Colour or Black & White and enjoy your own creation with this thin ergonomic mouse pad that is only 0.8mm thin! NO BENDING.....NO ARCHING......OF THE WRIST......KEEP THE FOREARM ON THE DESKTOP. Create your own design ... Print it ... Use it ... Enjoy it! It’s as simple as that! Use any Ink Jet Printer ... Xerox, Canon, Epson, Lexmark, Hewlett Packard ... Any make or model! Printing template and printing instructions provided in packs.